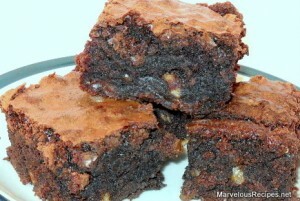 These delicious brownies will satisfy the pickiest chocolate lovers in your family!! 1. Heat oven to 350 degrees F. Grease an 8x8x2-inch baking pan. In medium mixing bowl, blend melted butter, sugar and vanilla. Add eggs; beat well with spoon. 2. In a small bowl, combine flour, cocoa, baking powder and salt; gradually add to egg mixture, beating until well blended. Stir in chocolate chips and nuts. 3. Spread into prepared pan. Bake 40-45 minutes or until brownies begin to pull away from sides of pan. Cool completely; cut into squares. Makes 16 brownies.